That's how my Aunt Shirley referred to furniture and home decor. Each item was a piece, to be collected and inserted into an overall scheme. She occasionally used this word in reference to a wardrobe, but mostly, she used it in reference to interior design. My Aunt lived in New Jersey, and her house, during my childhood, was the gold standard for grown up, luxurious living. Our own house was pretty - my mother was a bit of an Aunt Shirley protege - but our house had children in it. It wasn't quite the same. Our house was nice with evidence of small hands and a parenting lifestyle. Aunt Shirley's children, my cousins, were adults. She was my father's oldest sister and nearing her twenties when he was born. My aunt's New Jersey Tudor catered more to the adult experience. There was a floor to ceiling, wall spanning, black lacquer Italian storage unit that housed a fully stocked bar; the guest room walls were covered in silk and velvet. She preferred pieces that were Asian inspired or imported from Asia itself, but didn't limit herself. 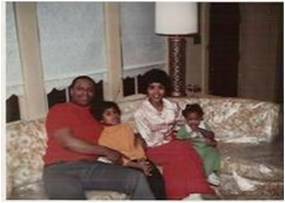 We would sit on the elaborately upholstered, winding sectional sofa in her living room (which in the spirit of the day was covered in plastic - a nod to the frequent visits by her nieces and nephews), and thumb through the photo albums showing my well traveled aunt in various locations. Posing in Barcelona, the islands, Italy... and her favorite, New York. Where I lived in New Jersey, it was possible to see the twin towers, hazy and off in the distance, from most of the street corners. Aunt Shirley loved going into the city for shows and sales, collecting her pieces, freshening a room with a new item. When we moved away from New Jersey, she would send extras to my mother, first in Syracuse, and then in Atlanta, sometimes a spare table, or an intricately carved bench. These items always went into a room we weren't allowed in. I can still so vividly recall being a child, lying in one of the twin beds in her guest room, running my fingers alongside the marble topped nightstand in between the two beds (and as I type that, I realize that it was at Aunt Shirley's house that I first saw that idea - a nightstand between two beds - and fell in love with it). I remember studying the carved cherub that served as a lamp base, or opening her closet door (solid wood door, glass door knob) and trying on all her high heeled shoes. Or looking at the screen print of an Asian scene, birds flocking near a river, a man walking with a paper umbrella. Or taking extra time in the single upstairs bathroom, luxuriating in the black marble vanity and the glass subway tile. Or just sitting in her dining room, staring wide eyed at her collection of red cape cod glassware. I always wonder what happened to that house. My aunt died in the mid-nineties, and the family opted to sell. I always have big plans to pull into the (still graveled?) driveway and see if her black Lab's chain is still wrapped around the apple tree in the backyard, if the antique stove in the basement (where she made her chitlins) is still there. If, that is, the new owners let me in. Aunt Shirley, thanks for introducing me to the world of decorating (along with my mother). With the two of you in heaven, I know the world is in for a treat. And I can't wait to see what you've done with the place.